If you are a design-freak, and studied a bit of ancient roman architectural history, you must have crossed path with the term ‘pergola’ once or twice. This specific garden architecture, pergola, was originally used by the roman emperors to create shade between buildings. It was also used to grow flowers and vines all over it which made them even more picturesque. Pergola is one of those oldest design structures that has stood the test of time with their functionality and aesthetic appeal. 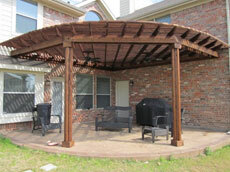 Pergola paved its way from ancient Rome to our modern households quite strongly. With customised designs and much efficiency, it has upped its demand in the market even more than before. It’s the simple yet intelligent layout of a pergola that makes it such useful garden or patio structure. It creates shade and keeps the harsh summer away. It offers support to vines and climbing plants while at the same time, creates an oasis for your home. It enhances the view and the quality of your free-time. It gives you a certain level of privacy from outsiders, also blocks out unsightly views. 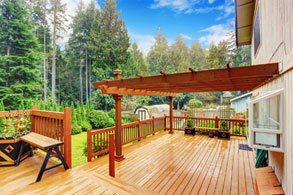 A smartly built pergola can increase the value of your home. When it comes to pergola, you have enough options to experiment with the designs and types. Just take measurements of the area and identify how you want to use the pergola and you are all set to go wild on the designs. Wall pergola (Attached pergola/ Lean to pergola): If you want a pergola to save you some space, wall pergola is the way to go. Unlike standard four postured pergolas, these pergolas are attached to the wall of your house and has only two posts. This can work as an excellent addition to your deck or patio as it will provide you with a shady spot to sit outdoors. In reference to the roman emperors, you can also have it act as a connecting shade between detached buildings. Using them as a transitional space between indoors and out can also add to the look of your house. Window pergola: A window pergola is much smaller in size than the regular ones and it is generally found hanging over the window or front doors or the garage. While you can understand why it can’t provide the benefits of a full-sized model, it can help to shade the interior of the home, cost much less and make a great accent piece to your home. 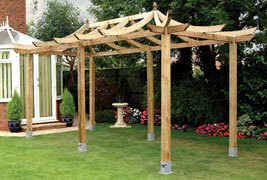 Corner pergola: As the name suggests, a corner pergola is made to fit in a corner. They are shaped like a triangle with three legs and lets you use the most of your outdoor space. While corner pergolas are not that common like the other types, they are very popular for use above outdoor kitchen or barbeque areas. Tuscan pergola: Tuscan pergolas have the quality to be the main focal point of the entire yard. It is lavishly four postured and can make a huge impact on your outdoor space. You can have the pillars made out of variety of materials like stone, wood etc. Japanese pergola: Curving upwards similar to much of the architecture in japan, Japanese pergola makes a statement itself. This type of pergola can easily emphasise the look an Asian style garden and can ornament a water feature to the perfection. 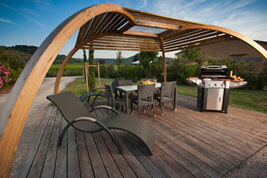 Amish pergola: Amish people are well-known for using only the highest quality woods and being expert craftsmen. Handmade wooden furniture is one of their specialities. The fact that each furniture is exclusively made by hand using real wood, makes two Amish pergolas never the same, each will have its own charm, distinct grain, and coloration. Arched pergola: Arched pergola can make another stylish embellishment to your home. Because of its shape, it can easily collect visitors envy towards your outdoor. It can be quite large too. Sometimes people use arched pergola as carport too. 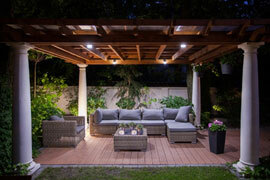 Louvered pergola: This specific type of pergola sets itself apart from the other types by the structure of its slats. Unlike other choices, a louvered pergola uses angled slats on the roof above. Angled slats blocks out more sunray thus provides more shade to the area. This slats are adjustable too making it even more convenient as a shade. It can be difficult sometimes to choose one when you have so many options available for pergola designs. MTB Carpentry and Construction has a team of skilled and experienced tradesman who can help you decide on what’s suitable to your home and can build it to perfection for you.